Firms take different approaches to template files. Some, (I’m looking at you @twiceroadsfool) like to load ’em up with most everything a project needs, and let the teams weed out what they find they don’t need. Others take a more streamlined approach, and provide the universal basics, with teams adding more in from ‘resource files’. And now they know: Which ones to edit, and which ones to not. 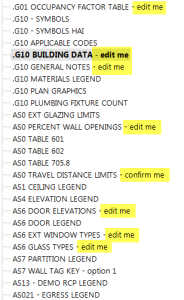 This entry was posted in BIM/Revit and tagged Annotations, BestPractice, Implementation, Legends, Revit, UserInterface. Bookmark the permalink.